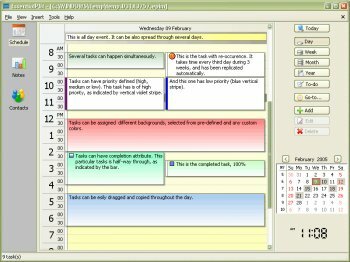 EssentialPIM includes Schedules, Notes, and Contacts modules. Each module has been designed to meet the highest industry standards. Colorful and easy to read day, week, month, and year schedules will help you to keep your plans in easy and convenient way – like you always wanted. Hierarchical multilevel structure of notes should help you to organize your notes and search through them with a click of a mouse. Adjustable views for comfortable representation of contacts allow you to see only that information, which you want to see. It is also capable of importing/exporting information to/from MS Outlook and MS Outlook Express, printing of schedules, notes, and contacts, and saving information into various popular formats like HTML, RTF, TXT, etc.